Objective: To evaluate the feasibility of S-1 and high-dose cisplatin short hydration regimens for outpatients with unresectable metastatic gastric cancer. Methods: Data for individual outpatients treated in our institution were retrospectively pooled to assess the feasibility of an S-1 and highdose cisplatin short hydration regimen (S-1: 80 to 120 mg on Days 1 to 21; cisplatin: 60 mg/m2 on Day 8, every 5 weeks), which included 2250 ml of intravenous fluids and 1000 ml oral hydration. Ten consecutive patients were treated with S-1 and high-dose cisplatin short hydration for unresectable metastatic gastric cancer from July 2011 to May 2012 and were included in the analysis. Results: With a median of 3.5 medication cycles, unscheduled admission occurred in two patients for 5 days each due to paralytic ileus and cerebral infarction. Four patients required dose reduction, in both S-1 and cisplatin in two patients, and in S-1 alone and cisplatin alone in one patient each. Renal function transiently declined after administration of cisplatin, but serum creatinine level and estimated glomerular filtration rate were both improved by the time of the next administration. Conclusion: This study suggests that an S-1 and high-dose cisplatin short hydration strategy for outpatients with unresectable metastatic gastric cancer might be feasible. Gastric cancer is one of the most common causes of death in Japan. Standard treatment for unresectable metastatic gastric cancer consists of systemic chemotherapy, and the standard regimen consists of the platinum analogue cisplatin combined with 5-fluorouracil, particularly S-1. However, the administration of cisplatin is limited by nephrotoxicity, the dose-limiting toxicity of this agent. In Japan, to reduce nephrotoxicity, a 24-h hydration period is recommended following administration. A number of trials have reported that hydration with 2 L and diuresis is sufficient to ensure the safety of cisplatin administration   , and that the addition of magnesium is effective in reducing this toxicity   . From July 2011, we utilized an S-1 and high-dose cisplatin (SP) short hydration regimen based on the National Comprehensive Cancer Network (NCCN) Guidelines Template for patients with unresectable metastatic gastric cancer, and shifted administration from an inpatient to an outpatient basis. To our knowledge, only one report of outpatient chemotherapy with SP in patients with gastric cancer has been published in Asian, including Japan  , however, the transition of renal function is unclear. Here, we retrospectively evaluated outpatient chemotherapy with SP short hydration for gastric cancer. From July 2011 to May 2012, ten consecutive patients were treated with the SP short hydration regimen for metastatic gastric cancer at our institution underwritten informed consent. Data were retrospectively collected from medical charts, including past and present history; laboratory data for the evaluation of hepatic, renal, and bone marrow function; and physiological examinations. We also collected radiological examinations as follows: computed tomography (CT) of the chest, abdomen, and pelvis, and esophagogastroduodenoscopy (EGD) with biopsy to confirm histology. Figure 1. Cisplatin administration. NaCl, sodium chloride; Mg, magnesium; min, minutes; CDDP, cisplatin. the 1st cycle, and before administration of cisplatin on Day 8 in every course from the 2nd cycle. The study was approved by the Institutional Review Board of our institution. Baseline characteristics are listed in Table1 Disease status was unresectable in seven patients and post-operative recurrence in three. The site of metastasis was the liver in two cases and the testis in one. Two patients had received previous adjuvant chemotherapy with S-1. Table 1 . Baseline characteristics. ECOG PS, Eastern Cooperative Oncology Group performance status; HER2, human epidermal growth factor receptor type 2. Table 2. Treatment compliance and response. CDDP, cisplatin; PD, progressive disease; AE, adverse event. after a previous operation. The paralytic ileus was improved with conservative treatment. Four patients required a dose reduction, as follows: reduction in both S-1 and cisplatin due to Grade 2 neutropenia and Grade 2 fatigue (n = 2); reduction in S-1 alone due to Grade 3 anemia (n = 1); and reduction in cisplatin alone due to Grade 2 appetite loss (n = 1). Treatment was extended in one patient due to Grade 3 leukopenia, and interrupted in four patients due to progressive disease (n = 1), and adverse events, including diarrhea (n = 1), cerebral infarction (n = 1) and peripheral sensory neuropathy (n = 1). Acute toxicities are listed in Table 3 and Table4 Acute Grade 3 or 4 hematologic toxicity included leukopenia in 10% (1/10), neutropenia in 10% (1/10) and anemia in 30%. Acute Grade 3 or 4 non-hematologic toxicity included anorexia in 10% (1/10), paralytic ileus in 10% (1/10) and cerebral infarction in 10% (1/10). There were no cases of vomiting of any grade and no treatment-related deaths. Changes in serum creatinine (SCr) and estimated glomerular filtration rate (eGFR) are shown in Figure 2 and Table5 Renal function transiently declined after administration of cisplatin. However, SCr and eGFR were improved by the time of the next administration. Table 3 . Hematological toxicities during chemotherapy (n = 10). Table 4. Non-hematological toxicities during chemotherapy (n = 10). Table 5. Transition of serum creatinine (SCr) and estimated glomerular filtration rate (eGFR). SCr, serum creatinine; eGFR, estimated glomerular filtration rate; SE, standard error. Figure 2. Changes in of serum creatinine level and estimated glomerular filtration rate (n = 10). (a) Change in serum creatinine; (b) Change in estimated glomerular filtration rate. for myelosuppression, 10% for anorexia, 10% for paralytic ileus and 10% for cerebral infarction. In the SPIRITS trial, a cornerstone Phase III trial of S-1 plus cisplatin for metastatic gastric cancer, Grade 3 or 4 adverse events in the SP arm were as follows: leucopenia (11%), neutropenia (40%), anemia (26%), thrombocytopenia (5%), febrile neutropenia (3%), anorexia (30%), nausea (11%), fatigue (4%), vomiting (4%), diarrhea (4%), stomatitis (0.7%), rash (2%) and hyponatremia (3%)  . Allowing for the substantial limitations of our study, these results are considered comparable with the previous study. The optimal intravenous solution and regimen for hydration are unclear, but in general at least 2 L of i.v. saline is required on the day of cisplatin administration to maintain good urine flow. This was therefore only conducted on the day of cisplatin administration. In Italy, Tiseo et al. (2007) also reported that a short period of hydration, including 2000 ml of fluid with control of diuresis, is feasible  . 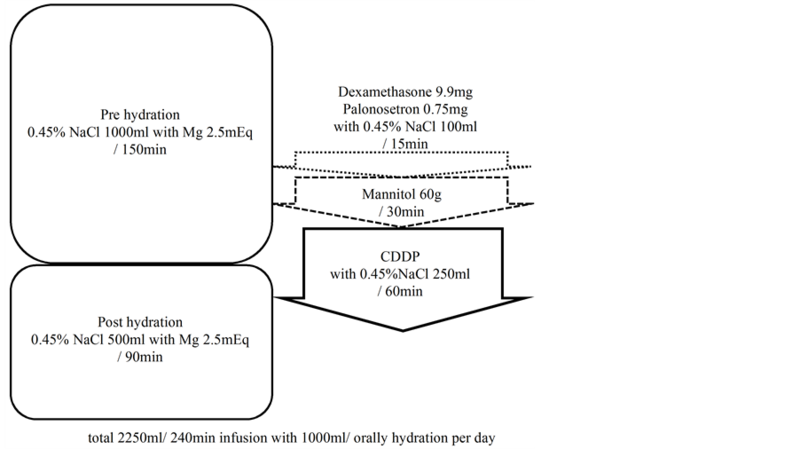 One reason for hydration is the critical importance of maintaining urine flow within 4 - 6 h of cisplatin administration to prevent nephrotoxicity. Approximately 90% of platinum becomes irreversibly bound to plasma protein within 4 h after cisplatin administration, and the plasma concentration of free platinum, which induces nephrotoxicity, decreases almost to the limit of quantification within 4 - 6 h after administration  . Most countries have accordingly started to administer cisplatin on an outpatient basis, but this change has yet to occur in Japan  . The development of the antiemetic drug aprepitant, a potent and selective antagonist of the neurokinin (NK)1 neurotransmitter receptor, and palonosetron, a second generation 5-hydroxytryptamine 3 (5-HT(3))-receptor antagonist, prevent chemotherapyinduced nausea and vomiting (CINV)]  - . In our study, we administered aprepitant, palonosetron and dexamethasone to prevent CINV, and Grade 3 or 4 nausea was not observed. This in turn allowed the oral intake of food and water, and acceptable nephrotoxicity. In economic terms, inpatient chemotherapy with a high-dose cisplatin regimen usually requires at least three days of administration, giving a medical cost in Japan of at least US $1200 for every cycle. In contrast, outpatient chemotherapy with high-dose cisplatin in combination with aprepitant plus palonosetron and dexamethasone as antiemetic prophylaxis costs approximately $700 per cycle in Japan. Total administration time of each SP short hydration regimen, which included 2250 ml of fluids with diuresis, was approximately 4 hours, allowing the management of the same regimen twice per day in the outpatient department. Limitations of the study include its small number of patients and single institution, retrospective study design. This study suggests that the SP short hydration strategy might be feasible in Japanese patients with gastric cancer, and can provide time saving for patients and reduce medical costs. A Phase II study of S-1 and high-dose cisplatin chemotherapy with short hydration for unresectable metastatic gastric cancer is now ongoing as part of the Japan Southwest Research Support Organization Group trial (JWOG-G1 trial). Tiseo, M., Martelli, O., Mancuso, A., Sormani, M.P., Bruzzi, P., Di Salvia, R., De Marinis, F. and Ardizzoni, A. (2007) Short Hydration Regimen and Nephrotoxicity of Intermediate to High-Dose Cisplatin-Based Chemotherapy for Outpatient Treatment in Lung Cancer and Mesothelioma. Tumori, 93, 138-144.